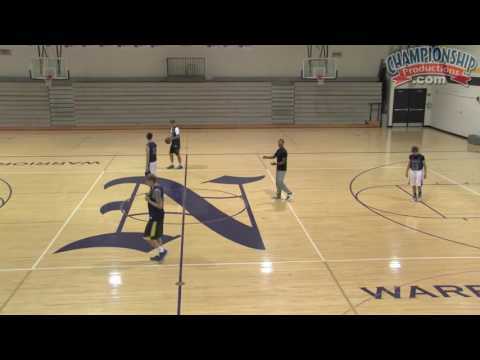 Have a variety of full-court scoring plays on hand for numerous late-clock situations! Basketball is a full-court game, and Coach McBeth uses this video to present some of his favorite full-court plays. These plays will help your team break pressure, score in late-game situations when you have to go the length of the court, and score on full-court throw-in plays at the end of the game. McBeth utilizes computer-generated diagrams on screen as he discusses each play, then uses on-court demonstrations to show the plays in action. McBeth presents several plays that will give you the opportunity to break full-court pressure and convert on the other end when leading (or tied) late in the game. Being able to get the ball across half court and score points is critical to closing out games. Several of the plays presented are given the same look as a typical full-court press break alignment. From a variety of alignments, you can disguise your typical press offense alignments with these full-court press break plays. The plays give you the opportunity to get a deep "home run" pass for lay-ups, as well as safer passes close to the inbounder. Additionally, you can have a variety of plays to run on spot throw-ins or when your inbounder has the freedom to run the baseline. Whether you are in need of a quick two points or an all-important 3-point shot, these plays will give you a chance to stay in the game if you are behind and time is an issue. Coach McBeth shows you a play to advance the ball to half court and call a quick timeout. From there, you can call a favorite end-of-game sideline inbound play for the win. With only enough time left for one shot, a full-court inbound play to score might be your team's last hope for a win or overtime. Coach McBeth presents several sets that can give you the chance to get the basket your team needs at the buzzer. Being prepared for late game situations could be the difference between your season continuing in postseason play, or heading home early!